The Victim Services Unit (VSU) helps crime victims, witnesses, and their families to overcome the devastating effects of crime. We have a highly experienced and educated staff of seven Advocate Caseworkers, one Licensed Professional Counselor, and a Volunteer Coordinator who supervises ten university interns who serve as caseworkers. 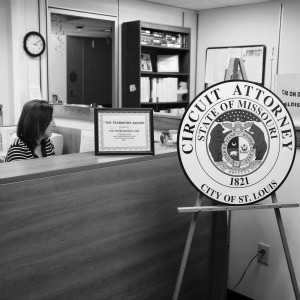 The CAO VSU is the leading prosecutor-based service provider in Missouri, and we collaborate with local and state agencies dedicated to supporting crime victims. If you or a loved one is a victim of a crime, we will help you understand your rights, provide information, counseling services, and overall help and support you throughout the criminal justice process. It is also important to remember your rights as a victim. These include the right to be notified of all hearings, be present at those hearings, and be provided the outcome of the case; to make a written or oral statement for consideration by the judge when sentencing the defendant; and to be notified of the release of an inmate from a correctional facility. These are only a few examples. For more information, please call (314) 622-4373.